Archer on Airguns: How Many Shots Can I Get From a QB79? The QB79 can be used with 3.5-ounce and 9-ounce re-fillable paintball tanks. Or a Daisy Avanti re-fillable tank. These are all mounted directly onto the gun. 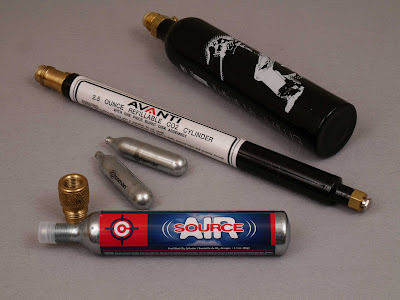 Alternatively it can be used with Crosman AirSource 88g tanks, in this case a Crosman AirSource/Paintball Adapter is required. Our photograph compares a 9-ounce paintball tank to the Avanti tank, an AirSource tank with adapter and 12g Powerlets, as used on the QB78 model. By comparison, a QB78 with two 12g Powerlets provides about 50 “good” shots before the point of impact starts to fall significantly. As with many other things in life, “your mileage may vary”. But these figures are a good approximation. Thanks for the comment. I'm glad that you're happy with your Archer Airguns QB78.